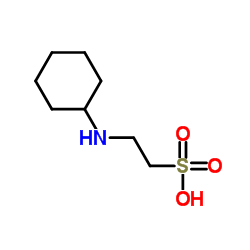 CHES is a zwitterionic buffering agent used in biochemistry and molecular biology. It is a cyclohexylamine buffer that is useful for a pH range of 8.6 – 10.0 and commonly used to study enzymatic processes above physiological pH. CHES displays only weak or negligible complexation capabilities for some metals making it a suitable non-coordinating buffer for use in most solutions containing metal ions. CHES displays high affinity for the iodoacetate binding site of liver alcohol dehydrogenase, protecting the enzyme from inactivation by iodoacetic acid. This ultimate buffer selection guide is a fantastic graphical display, showing common buffer pH ranges and their associated pKa. Buffers on this chart are also categorized by family. It's perfect to print out for your lab. Refer to this printable buffer-pH chart for common buffers, associated pKa and pH range. Information on this chart is displayed in vibrant colors, and makes a great print-out for your lab. A user guide for the background, experimental use and technical discussion of GoldBio biological buffers.